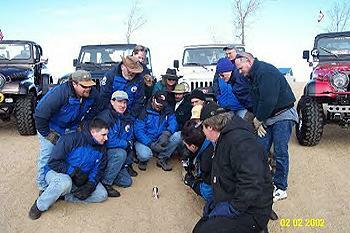 On Groundhog Day,,,,,Saturday February 2nd, 2002, the HoboJeepers joined the rest of MHJC showing our rigs at Aurora's Fire & Ice Festival. 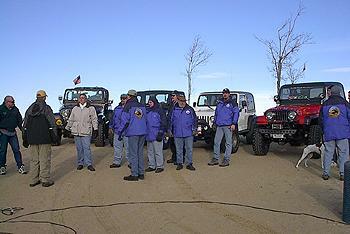 Organized by MHJC's Patrol 14, there was about 20 MHJC vehicles in a 'Jeep Show' as part of the festival's activities. Patrol 12 was represented by Tom Allen and Brian & Margie Hoag. 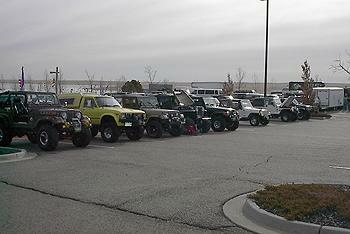 The HoboJeepers who attended and showed, were myself (CJ-with my jeepin' sidekick Molly), Paul 'Weiszguy' Weisz & son Brett (CJ7), Ken 'Toolman' Kordes (61 Ford), Marc 'Nugget' & Kristen Gilbertson (CJ7), and Chris 'Colonel' Potter & sons (CJ7). 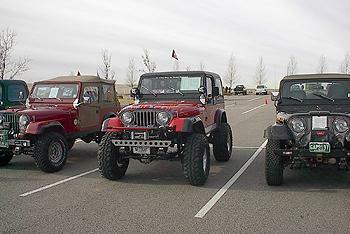 Jed 'Clampett' McCleeland dropped by in the morning to check out the fun for awhile also. 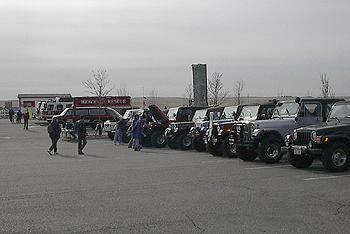 We were up bright (well it was pretty dark) and early in the morning, to meet each other near Hampden & I-25 at 6:45am. It was mighty cold! With a slight breeze, even the 8 degree reading felt bitter. 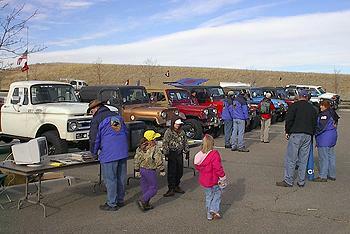 But, the adrenaline seems to have kept me warm as we headed off to Aurora Reservoir to the East. 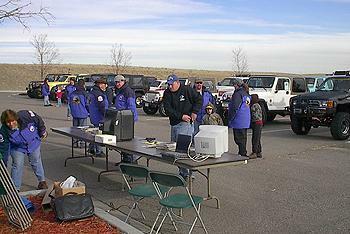 We arrived and set-up in a parking lot along with many other people like the Aurora Fire and Police, The Mile-Hi Snowmobile Club, the fruitcake slingshot, the climbing wall, and many others. Ahhhh...this fire was nice and toasty!! 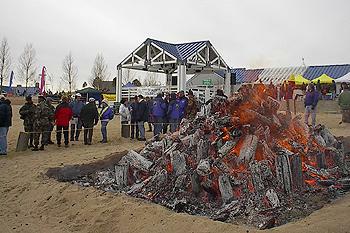 Around 9am, people were arriving for this free Winter event. The sun didn't seem to arrive though till the end of the day, but at least the winds were calm. 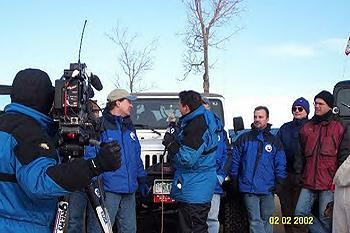 9News was there early and interviewed Tom Hester during the Saturday morning show, and we all predicted 6 more weeks of Winter as we all saw the shadow from the ground-hog Nick Carter stuck in the sand. There actually was a shadow, can you see it??. 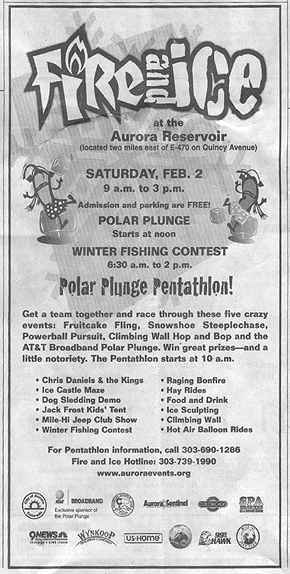 There was much to do at the festival,,,,,,,,,one could par take in a dog sled or hay ride, climb a wall, fling a fruitcake, listen to some speakers on hawks, chow on a turkey leg, check out the many booths, listen to the live band, try your hand at ice fishing (fishing contest), warm up to a huge bonfire, or if your crazy,,,,take a 'Polar Plunge' in the reservoir! 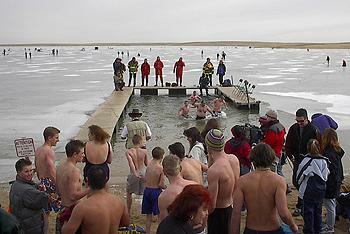 There were teams competing in 5 different events culminating in a dip in the icy water. Ahhhhh yes, as most of the sane people were downing jackets, hats, and gloves (and even long johns), some couldn't resist a chance to increase the heart rate to extreme levels. 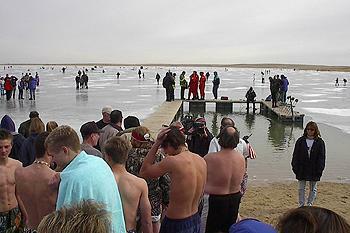 At high noon, the 'Polar Plunge' was safely supervised, and judged. Hot tubs were provided to bring up ones body temperature after the initial shock. I stuck to staying above the ice, and checked out a seminar on ice fishing (they guy actually caught one while demonstrating!). 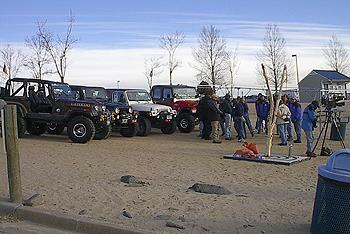 A fun day by all (though not on the trail), but still a great way to break that 'cabin fever', while also getting a chance to charge up my Jeep battery! 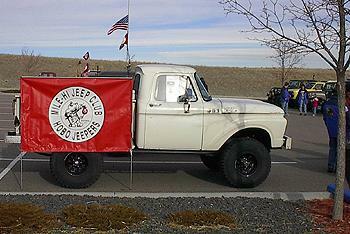 Thanks to Patrol 14 for entering MHJC in a Jeep Show, as got some good exposure for the club. Yep, nice to 'get out' and enjoy Groundhog Day at the lake with good friends.